The 108W and 108K are similar to the 151W and 151K, differing mainly in hook and bobbin case style. The 108W class are currently manufactured as 108U class machines. The most common models include the 108W1 and 108K1 for plain sewing, the 108W3 and 108K3 for binding, and the 108W20 and 108K20 cylinder arm machines for binding. 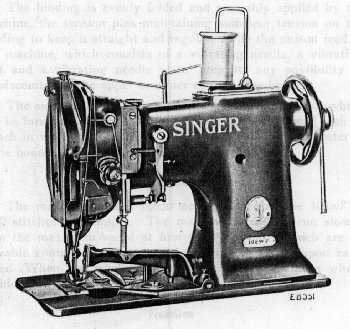 Following is an excerpt from a Singer 108W7 manual which was reissued in 1930. Machine 108w7 is equipped with a vertical trimmer and is especially designed for trimming and binding corsets, brassieres, corset covers, etc., in one operation. It is also used for trimming and binding waists, blouses, dresses, children's wash suits, middies, sleeve linings or for any work where it is desired to trim and bind in one operation. The machine has one needle and a belt driven rotary sewing hook and makes the lock stitch. The binding is evenly folded and smoothly applied with the machine, the tension pins maintaining sufficient tension on the binding to keep it straight and regular, while the unison feed of the machine, which consists of a vibrating needle, a vibrating foot and a vibrating needle plate, prevents any possibility of displacement of the upper or under edges of the lining. The machine is regularly equipped with Binder 224606 which can be furnished for tapes or folded strip material from 1/2 inch to 3/4 inch in width, as ordered. A sample of binding and material to be bound should accompany orders for binders. The maximum speed recommended for Machine 108w7 is 2800 stitches per minute. The machine should run slower than the maximum speed at first until the parts which are in movable contact have become glazed by the action upon each other. When the machine is in operation, the balance wheel should always turn over toward the operator.